Reliable air conditioning, fridge operation, and water maker output depend on a clean flow of salt water. 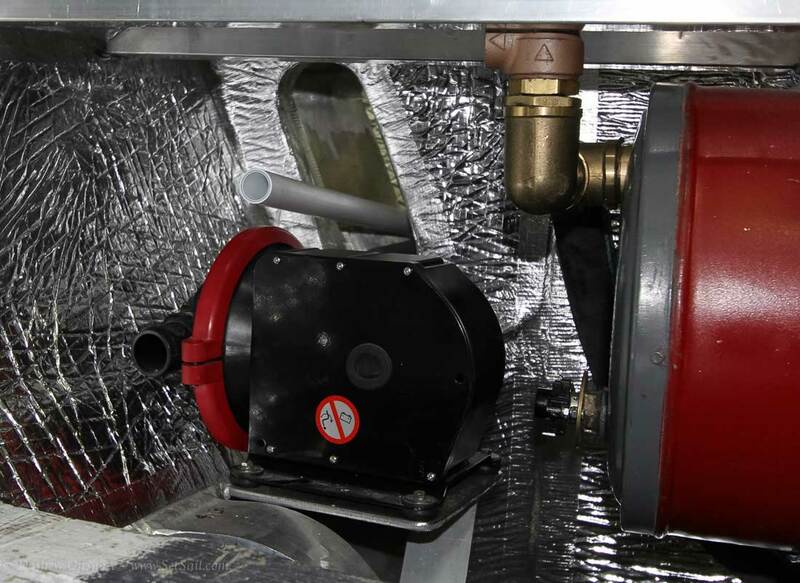 Trapping air in the plumbing, which leads to loss of flow, is a common problem due to suboptimal layout. This is the way it should be done. 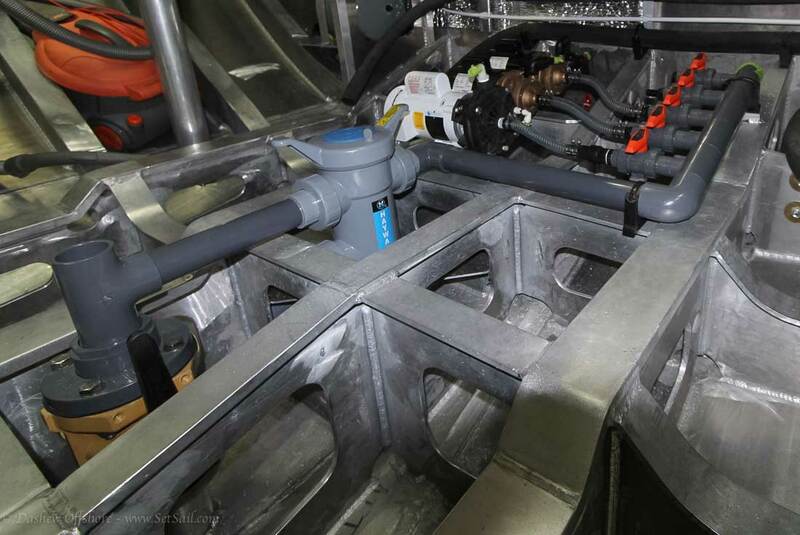 The “T” on top of the through hull valve will have a standpipe attached that is plugged at the top. This will be used to clean the inside of the pipe and valve when they become clogged. The Hayward strainer is oversized to allow longer operation in foul environments. Note the upward slope of the manifold and plumbing to the pumps. This allows air to clear itself. There will be a vent line at the end (high spot) of the manifold to aid in clearing as well. Raw water feed to the engines has the valve above the waterline. This will allow the valve to be removed for maintenance without hauling out. 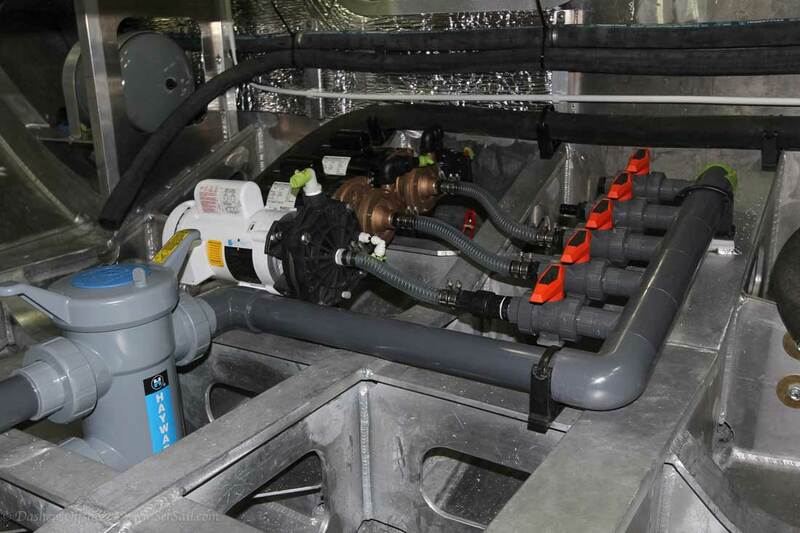 Each engine and the genset have their own standpipe and strainer. Looking at the port forward engine room corner. The day tank sump is centered and the balance of the day tank is above the photo. The opening in the bulkhead provides access under the shower seat for building and future maintenance. 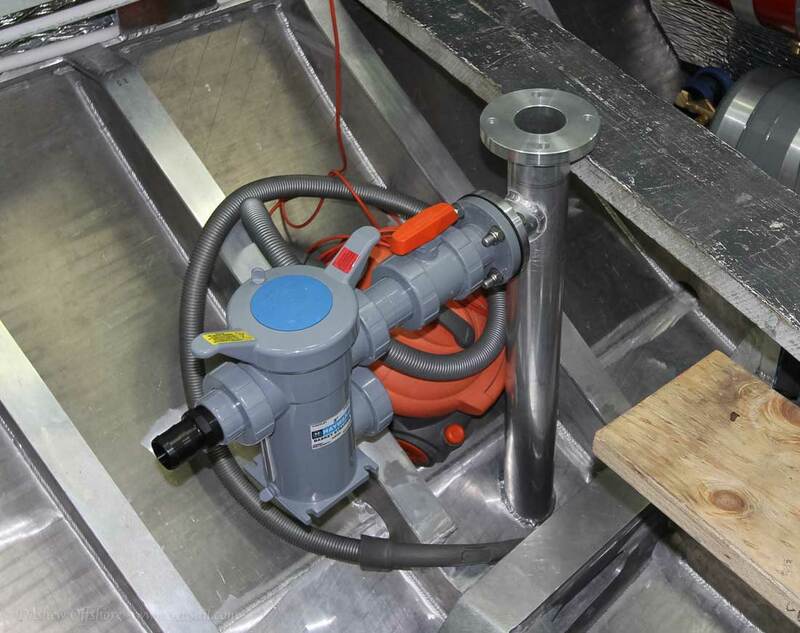 Lazarette bilge pump is mounted in the engine room for easier access and to keep the aft bilge clear for storage. 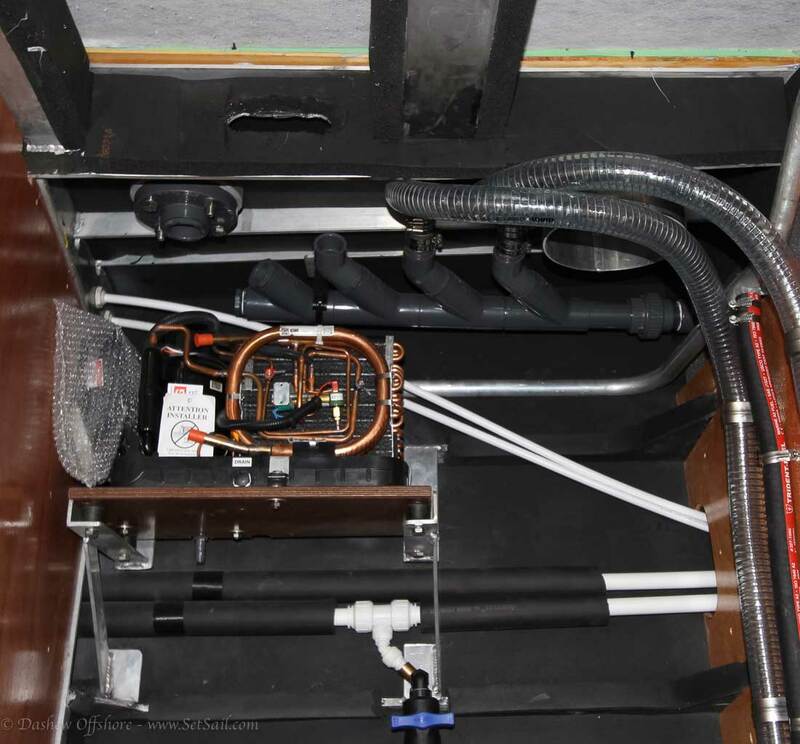 The fuel and heater manifolds are located in the midships plumbing systems closet, along with the damage control pump and its selection manifold are shown above. 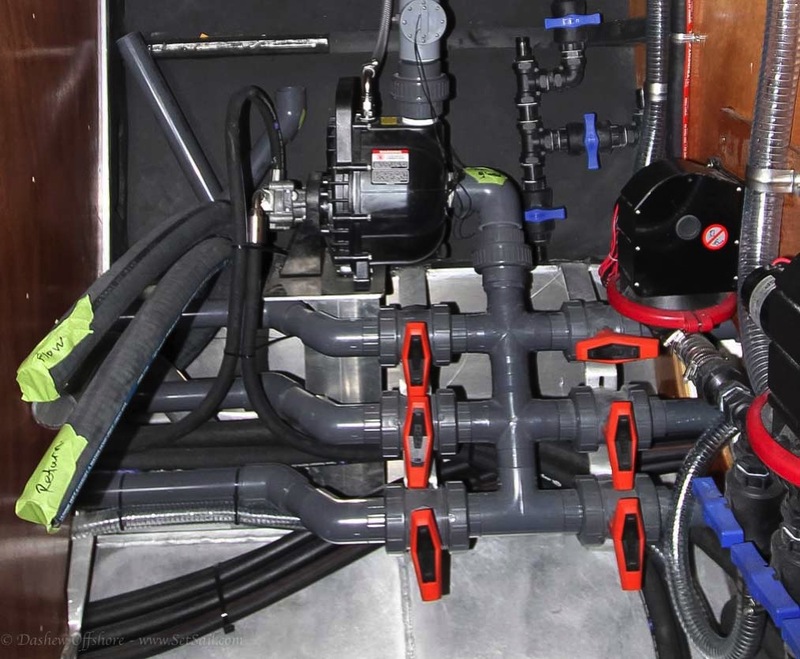 There are also a pair of bilge pumps that will be used for tank margins (mainly condensation in cold water), the stabilizer coffer dams, and the depressed tank top area amidships. 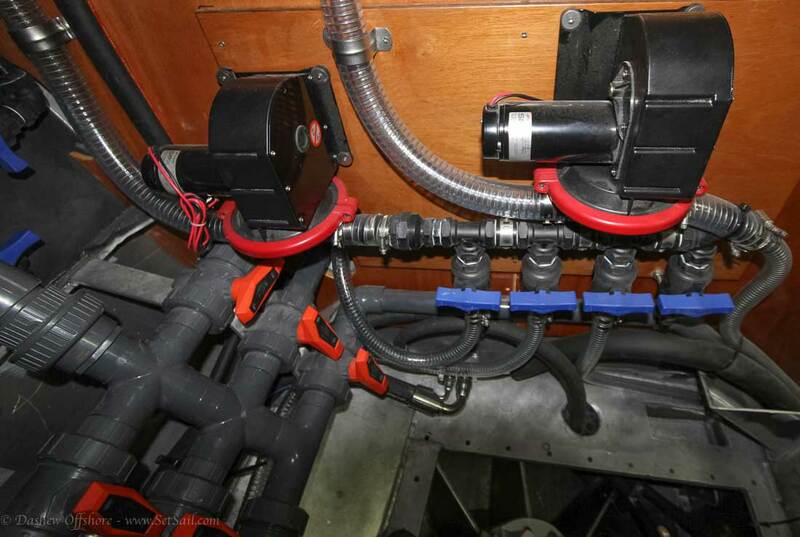 The PVC manifold above is for grey and bilge water, the galley sunk, and the previously mentioned bilge pumps. The galley sink has the option of direct discharge as well. Finally, an early look at what will become the best cruising workshop ever and one of our favorite things on the FPB 78. 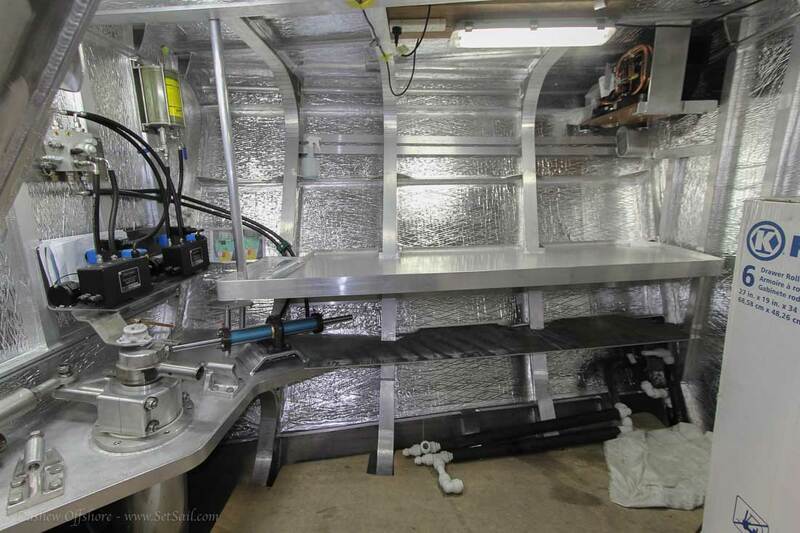 There is that substantial work bench, a storage shelf under it, a huge toolbox (hidden below the box to the right), and loads of wall space for racks and photos. 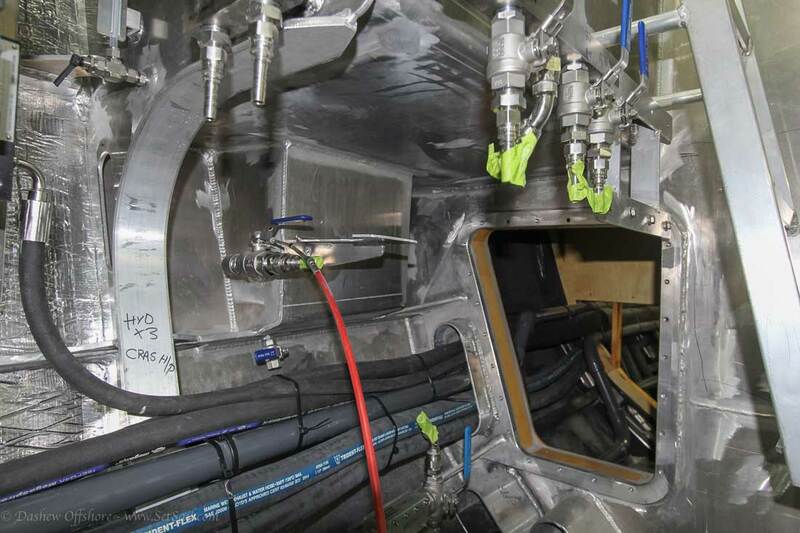 There is also a large area below the sole and aft for lubricants, filters, spare parts, etc. The workbench will have a vice, drill press, bearing press, grinder, and disc sander. And of course, there will be room for a large screen TV tied into the vessel monitoring and navigation system. There is also an air conditioner. This entry was posted on Tuesday, June 23rd, 2015 at 9:31 am and is filed under Dashew Logs, FPB 78, The Logs, three. Both comments and pings are currently closed. Lovely photos, Steve. The robustness of the construction is awesome and the engineering very elegant. I bet you both must be itching to go cruising ( and put to use that workshop)! One thought though – is the valve on the standpipe really above water level? Or is water level just below the top of the standpipe? Does this mean that the standpipe needs “priming” to get the air out when it is sealed at the top, for the water flow to the engine? I also presume that the standpipe is the same alloy as the hull? The valves are above the waterline. However, the engines are rated for a 3 meter / ten foot suction lift and the strainer basket and hose form a wet loop so priming is not required. Alloy of the standpipes are same as the hull. Nice pics! Thank you Steve. You are not using de fresh water recirculating tanks for the A/C? Back to salt water it is for air conditioning. Hi Steve, as a long time sailor from NZ that went aboard Beowulf with Linda and yourself many years ago in the Caribbean I have always been a fan. However in my commercially registered world of yachting I’m not sure that all that PVC would meet code? Unless I am mistaken I think there are PVC valves, strainers, and pipework all below the waterline? What are your thoughts in relation to this and an engine room fire? Or have I maybe missed something? We wrestle with the raw water materials, and use CPVC because we feel the maintenance benefits and fire risks related thereto are a better tradeoff than using stainless or bronze. FPB 78-2 and 64-4 are coded and as such require metal. Hi Steve, In reading some of the blog entries from Grey Wolf, it states that the AC motor start capacitors are a fairly common thing to fail and need replacement. It also implies that they are a fair bit difficult to get too and replace. Is there any reason these could not be mounted slightly away from the AC unit where they could be easily accessed? Great job on the above systems. This is one of the things that I absolutely obsess over and you clearly do as well. Fantastic job by all involved. The Climma air conditioners used on the FPB 64s had a problem with either the specification or quality on their start capacitors. Replacing the start capacitors with more robust units solved the problem.